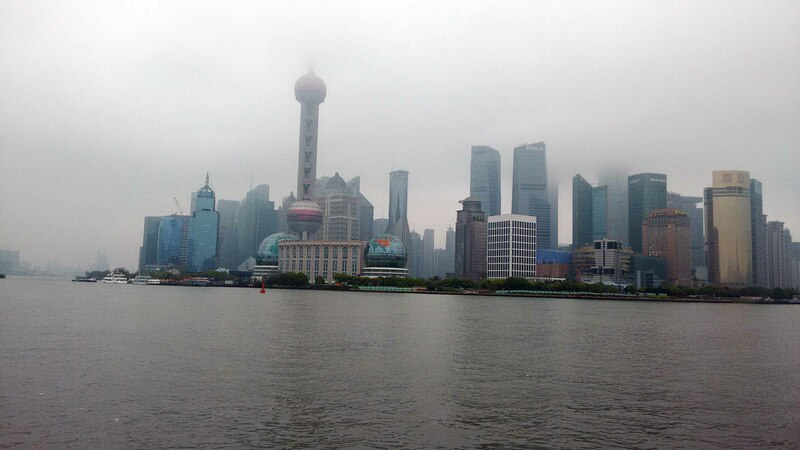 The final destination for our cruise was the port of Baoshan, or Shanghai China. We disembarked to find the city raining, foggy and cold. After 7 months in South-east Asia, with daily temperatures hovering between 31-32 degrees Celsius, we felt the chill of a wet 7 degrees down to the marrow of our bones. Getting a “normal” visa for China is a bit of a process. However, for Canadians – once you have the visa, it is valid as long as your passport is valid. 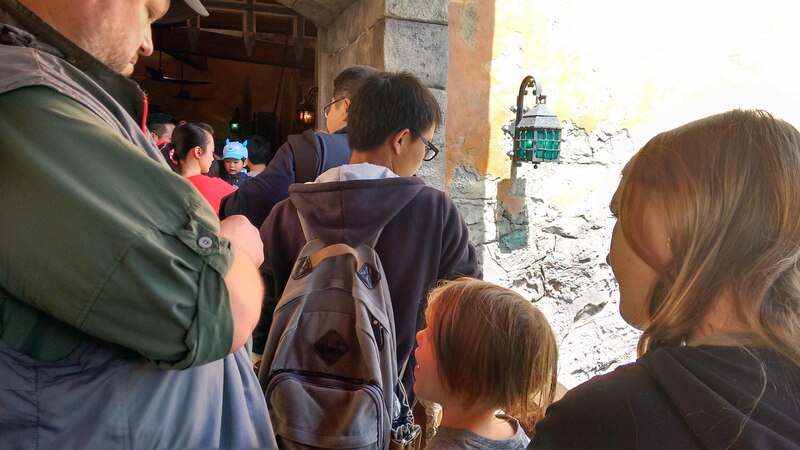 We had started the process of getting a visa for China last summer while we were still in Canada, but when our travel plans changed we abandoned the process. What Shanghai offers (which is great), is a 144 hour transit visa. This visa is available to visitors who arrive via boat or air and have Shanghai as a stop while they are enroute to other destinations. 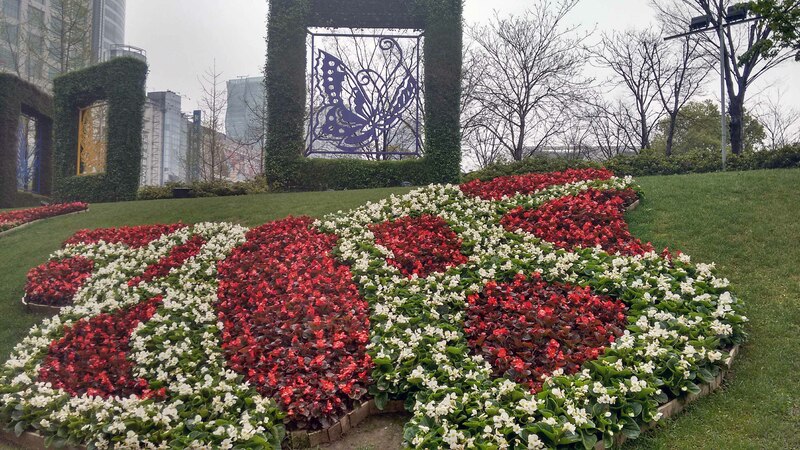 We were happy that we could take advantage of this visa so we could see some of Shanghai. 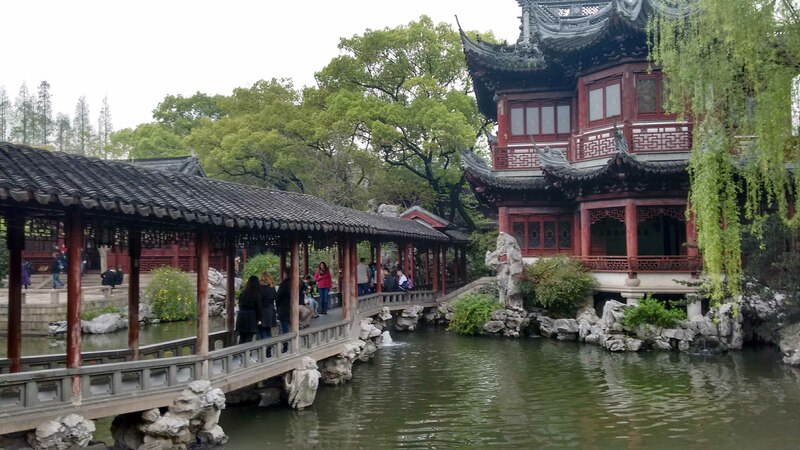 To make the most of our time in Shanghai, we decided to take a two day “Hop-on-hop-off” bus tour through the city. The routes were a bit of a hike from our hotel, so we decided to attempt to use the subway system. I always find learning the public transit system in a location to be stressful. Once I’ve managed a trip on it though, I always feel a sense of accomplishment. One of my hopes for Morgan and Artie is that they grow up confident enough that transit systems, regardless of where they find themselves – are just another thing that you do. We managed to figure out the system and made our way to People’s Square. 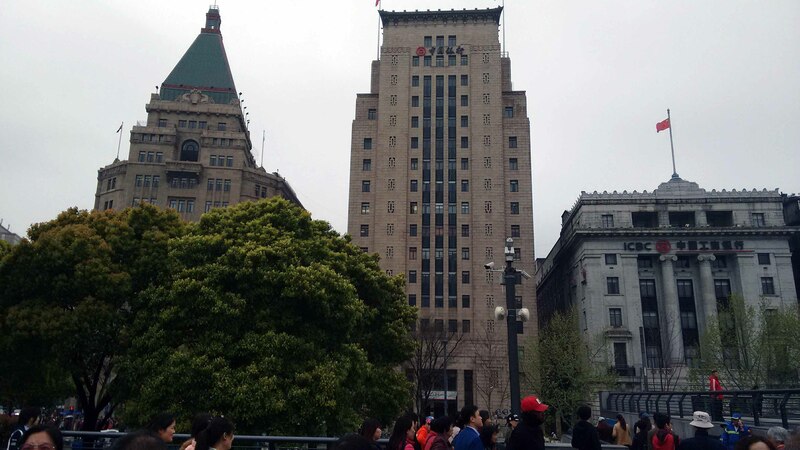 Our next stop on the route was the Bund. The Bund is known for its beautiful, and diverse architecture. You can see the different architectural influences present in this photo. I have been unsuccessful in finding out what this building is, but I found it to be so striking. 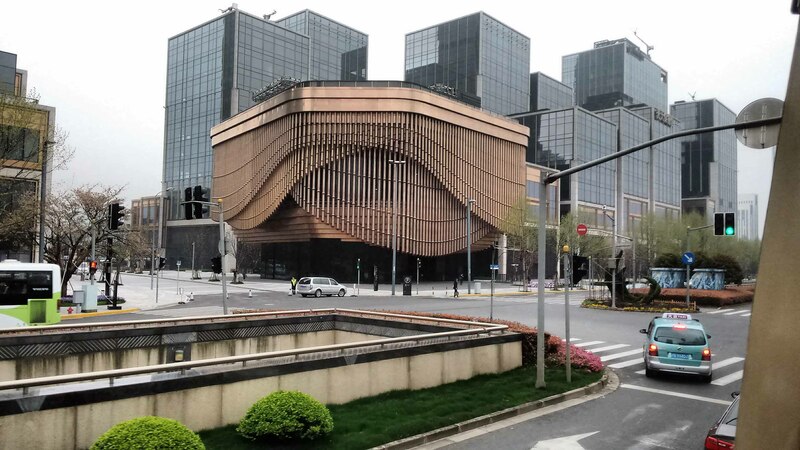 It reminded me of a giant pipe organ. 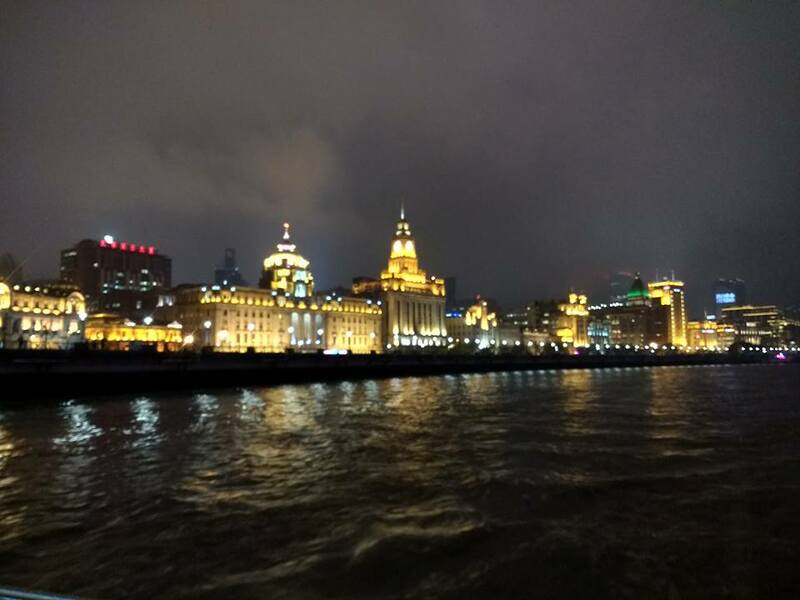 The Bund is on the banks of the Huangpu River (which is pronounced “Hung-poo”… and yes – Artie liked saying that name… a lot…). It provides a fabulous view of the financial district buildings across the river as well as the Pearl Tower. One of the ways to get across the river, is to take the Bund Sightseeing Tunnel. It was included with the tour that we purchased, and is is a unique experience… For some reason I thought we would be seeing fish as we went through the tunnel. The sights that you see from your glass pod as you cross the river through the tunnel are a psychedelic light show, complete with a musical accompaniment. “Clockwork Orangish” is how I would best describe the experience. The iconic Pearl Tower is on the other side of the river. It is a telecommunications tower (like the CN tower in Toronto), and unique in that it contains two shimmery purple “pearls”. There are a number of other high towers fairly close by. 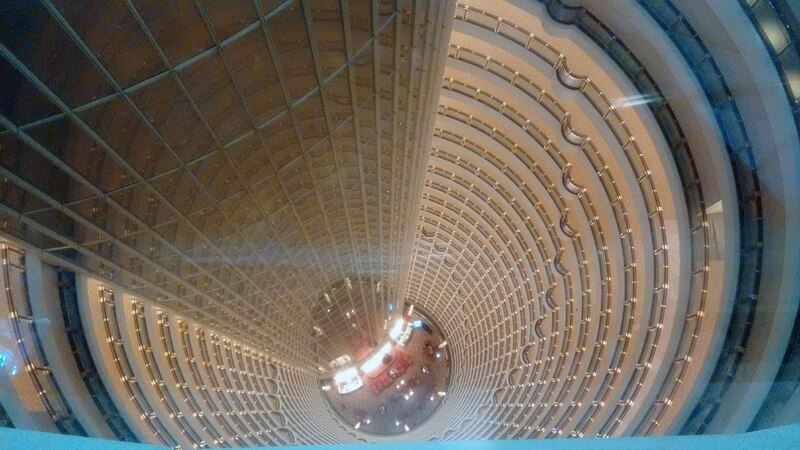 We went up to the 88th floor observation deck of the Jin Mao Tower. 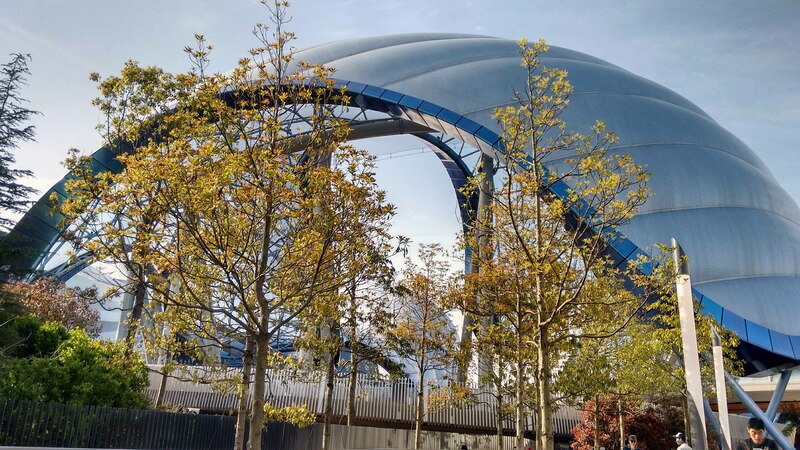 It is a building that integrates the principles of the number 8 within its design and architecture. 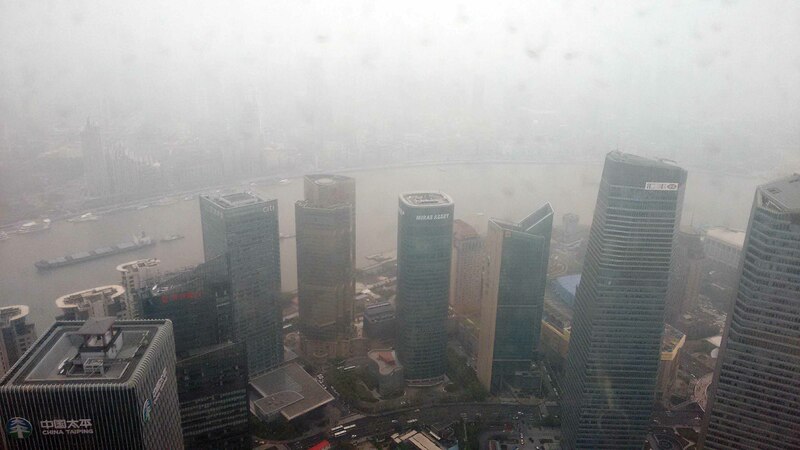 Visibility was poor during our visit to the Jin Mao Tower. Apparently, on a clear day you can see as far as the Yangtze River. 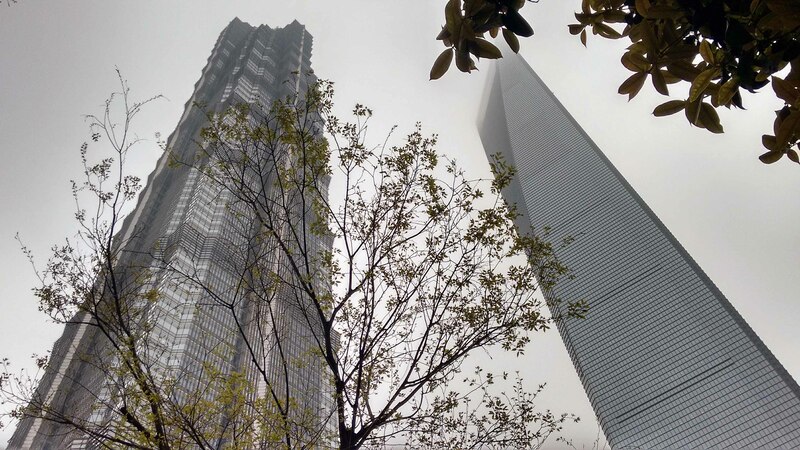 A sight that is stunning through from the observation deck, regardless of the weather is that of the atrium of the Grand Hyatt Shanghai hotel which spans the twenty-eight floors directly below the observation deck. 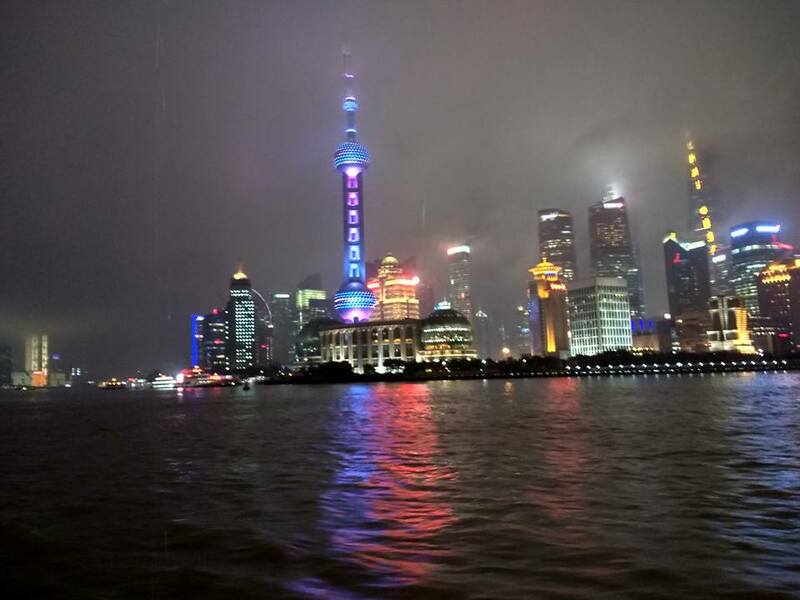 I think that the best way to see the sights along the Huangpu River though is to take a river cruise, ideally at night and when it isn’t raining. This is what the Pearl Tower looks like at night. 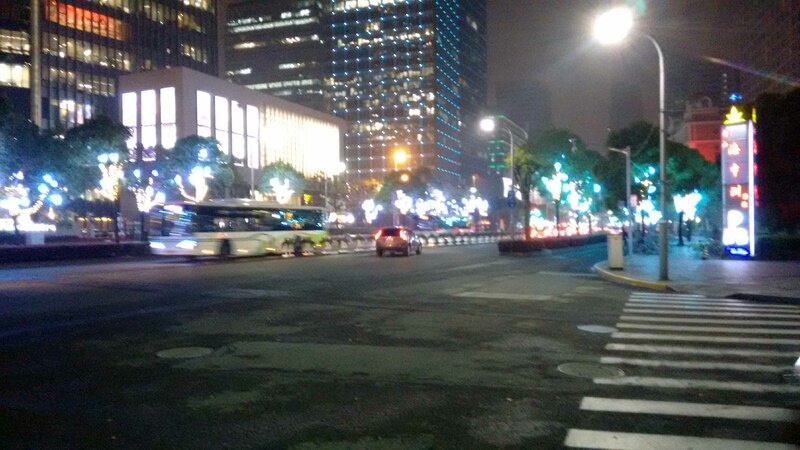 This is a view of the same area of the Bund that was in the earlier photo, when it is lit up at night. I have to thank Marcus for standing out on the deck of the boat in the rain to get us some (stunning) photos of the lights. 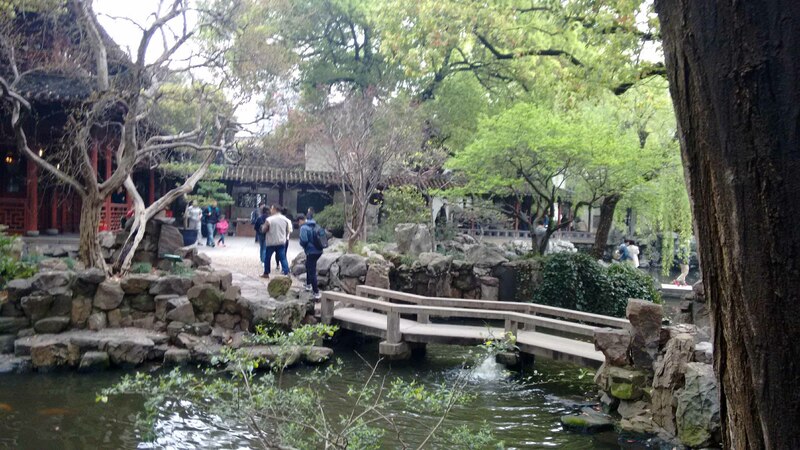 For me, one of the must-see places in Shanghai was the Yu Garden (or the “Happiness Garden”). It took us a bit to figure out how to get there though, and we had a few “false starts” before we managed to get there. The bright blue and green Tele-tubby-like creatures in this photo are Morgan and Artie, making use of their quilted jackets (that pack into neck-rests). With the rain and cold that we experienced during our first couple of days in Shanghai, we were SO grateful that we had those warm jackets. 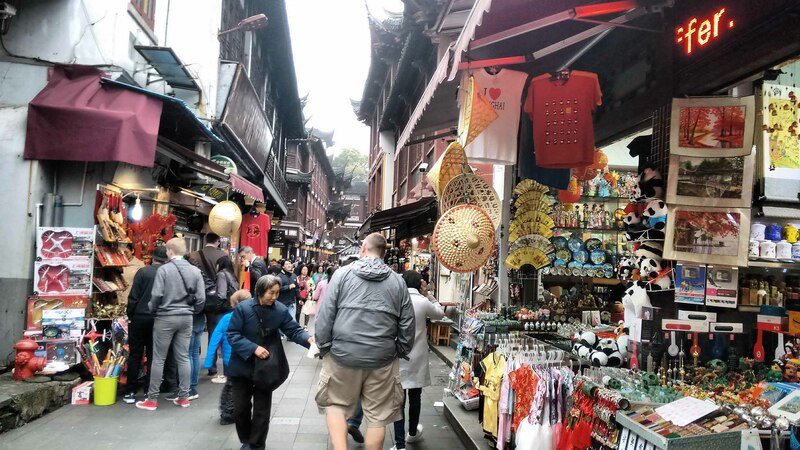 The area outside of Yu Gardens is a bit chaotic. Essentially how we expected all of Shanghai to be. Once we finally found the entrance to the garden though, we weren’t disappointed. It does live up to its name, and its reputation. There are a number of places within the garden that encourage some climbing and exploration (which suited Artie just fine). 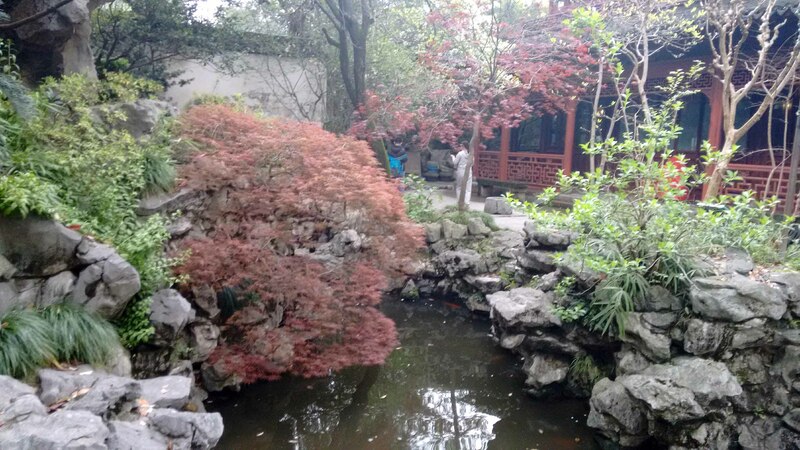 The garden is made up of a number of different areas and sections with different themes and buildings. Water, buildings, plantings and hardscape features are built into the design. 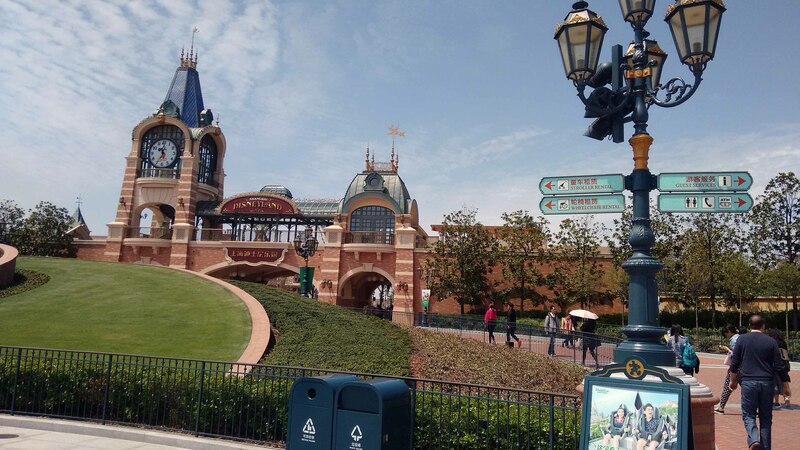 Our final day in Shanghai was spent at… Shanghai Disney. Our day there was thanks to Christmas money from Grandma Green, and as a special surprise reward to the kids for finishing all of their curriculum requirements during our six months in Penang. 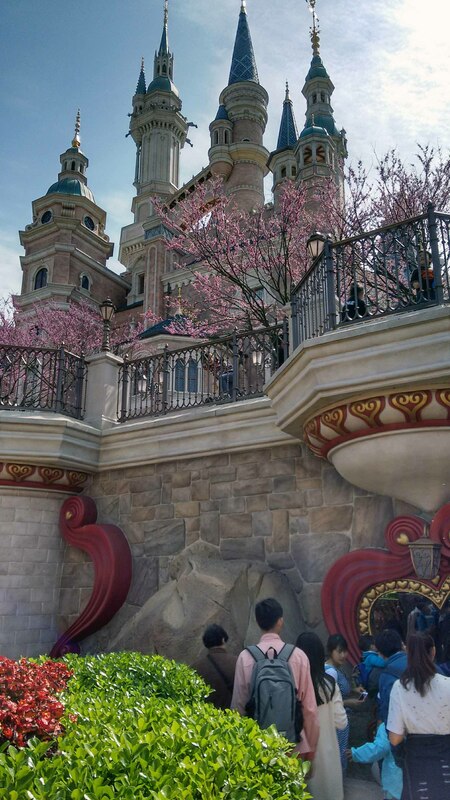 Apparently, the castle at this park is the largest in the Disney Empire. We did spent a lot of the day waiting in line, but the attractions were worth it. If you have heard hype about the Pirates of the Caribbean ride here, I do have to say that it is worth experiencing. It was my favourite part of the day (and worth the wait in line). Artie’s favourite thing was the Tron ride. He was completely lit up talking about it afterwards. 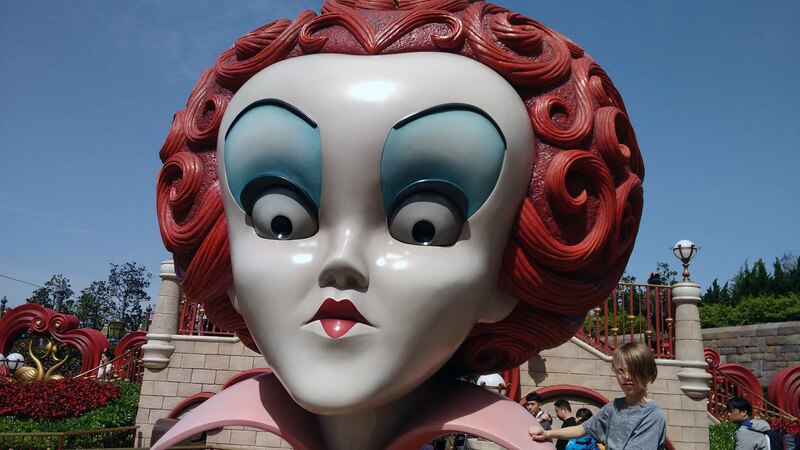 I enjoyed seeing Artie’s head next to the head of the Queen of Hearts. 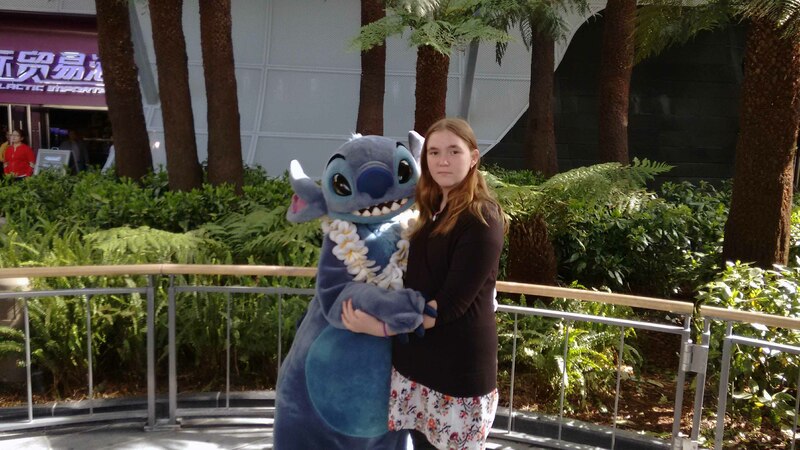 Morgan loved hugging Stitch (who she said was “super soft”), and she wants pyjamas made that feel like Stitch. 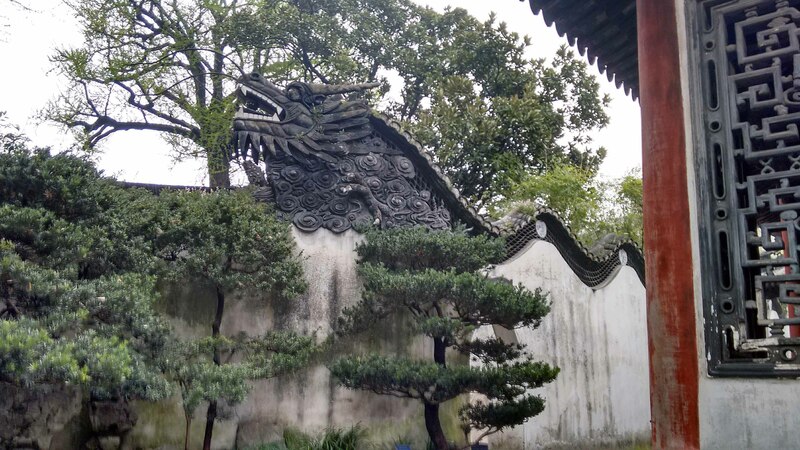 We saw a lot of beautiful sights during our eighty-eight hours in Shanghai, and I’m grateful for that opportunity. 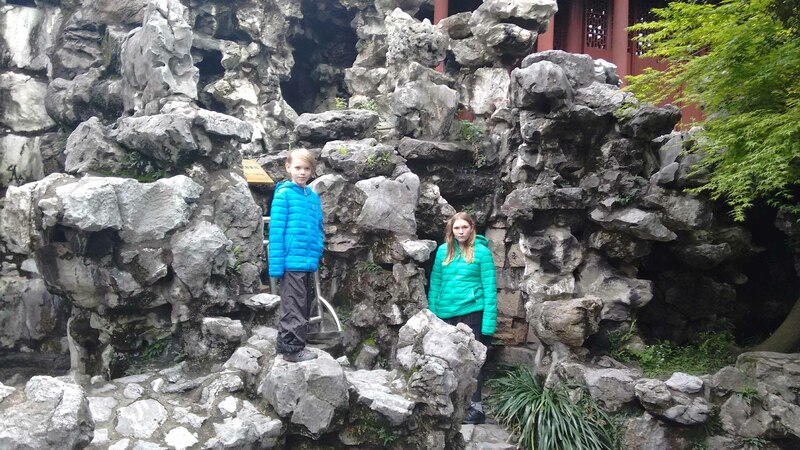 We did not feel welcome as westerners in China though… and at times – the contempt was pretty blatant. We expected to encounter some of this, but I think that we were surprised by how much of it we encountered. So as grateful as we were to experience a part of China, we were equally grateful to leave China as well. Great post, feel like I was there!